Summer Grilling Is Where It’s At! 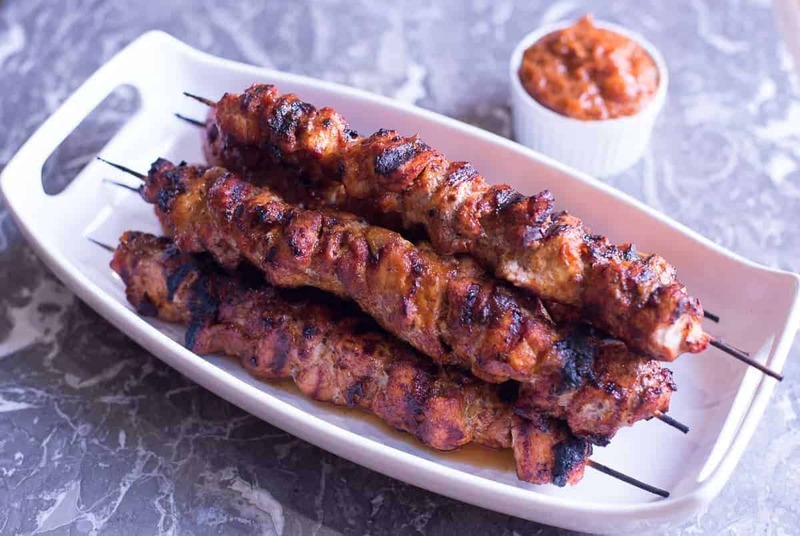 These pork skewers are tender and juicy, and slathered with a rich, spicy – sweet peach bourbon BBQ sauce. I could cook on the grill every day. I love grilled meats and veggies – and being outside while I’m cooking; not to mention the easier cleanup that comes with throwing everything on the grill. Who needs pots and pans? I recently discovered a pork tri-tip cut. My butcher recommended it. He called it a pork club roast. It is a nice tender cut that is leaner than a shoulder cut. I had actually never heard of it before. I am not sure how common it is. If you love cooking as much as I do, you really should be on a first name basis with your butcher. If you can’t find this ‘club roast’ cut you can use pork shoulder instead. Pork shoulder is less lean but has a ton of flavor. Peaches and Bourbon – Is there a better combination? Being a bourbon fan I might be little bit prejudice here. Because if we’re being honest, bourbon goes with just about everything, right? This barbecue sauce has the perfect amount of sweet heat. The peaches and the panela sugar create a nice caramelly flavor, while the bourbon and cayenne give it a nice spicy kick. I highly recommend going out of your way to find the panela sugar. It is always the little details that set something over the top. This is an example of that. You can’t quite reproduce the rich flavor in this sauce with brown sugar. And while of course this barbecue sauce is delicious either way, the panela sugar makes it a stand out as exceptional. Peach Bourbon BBQ Sauce is a Keeper. There are some recipes that I keep making over and over again. This is definitely one of them. This barbecue sauce is great on pork or chicken. I’ve also made these skewers with a little bit of applewood smoked bacon slapped between each piece of meat. Can you say bacon-tastic? To get our Top 5 Master Spice Mixes for FREE sign up for our email. We have started rolling out members-only content and want to share it with you. 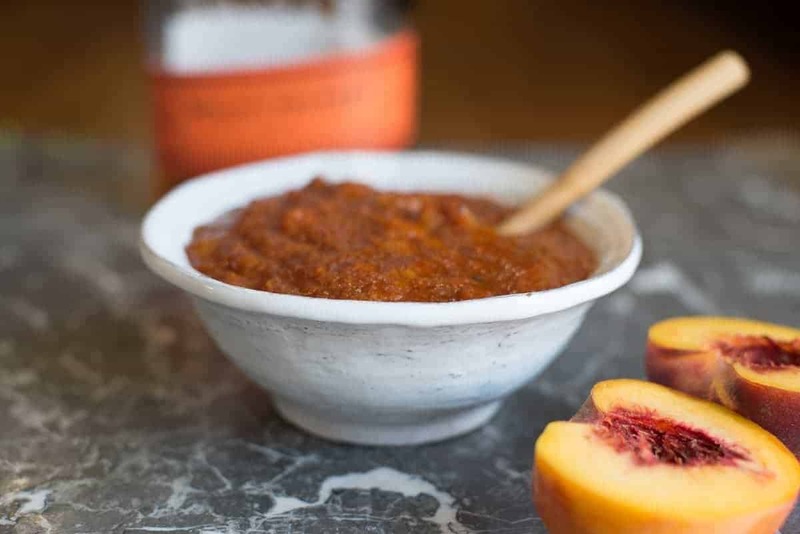 Sweet and spicy Peach Bourbon BBQ sauce. Great with pork or chicken. Add oil, onion, garlic and peaches to a medium sized sauce pan. Cook on medium high until peaches are soft. Time will vary depending on how ripe your peaches are. Add tomato paste, and sugar. Allow to incorporate into the fruit. Add apple cider vinegar and bourbon. Bring to a boil. Reduce temperature and add spices. Simmer to let spices infuse into sauce.